Earlier this year I mentioned I was holding off on some good news until all my ducks were in a row, papers signed and the news could be made official. Well, I'm very happy to announce that those lovely people at Severn House Publishers will be publishing a brand new thriller series from me, featuring new characters Tess Grey and Nicolas "Po" Villere. The first in this brand new action-packed series is called BLOOD TRACKS and will be available in the UK in November this year, and in the USA (and rest of the world) next Spring. 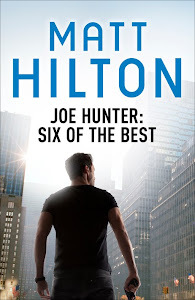 Joe Hunter fans will love this new series, and hopefully it will garner a new readership too. On the subject of everyone's favourite vigilante, fear not. This is not a departure from Hunter's adventures. Hunter will continue too. So if you enjoy my books, rejoice, because I'll be back to (at least) 2 books a year from here on in. Excellent news, Matt! I love that the new series will include a female protagonist too. Looking forward to reading Blood Tracks.